Starring Ryan Gosling, ‘First Man’ recreates the trials and triumphs of the Apollo 11 hero and NASA icon in vivid detail. F	F	irst Man, the highly anticipated new biopic about Neil Armstrong, stunningly portrays the person who first set foot upon the moon in all his many juxtapositions and contrasts. The man who remains a public icon but who fiercely guarded his privacy; the quiet and reticent hero who had a disarmingly wry sense of humor; the steely-eyed missile man who chased his young sons around the house in wild fun. Starring Ryan Gosling as Armstrong and Claire Foy as Armstrong’s wife Janet, First Man puts you inside the cramped, dark spacecraft of the Apollo 11 mission along with the crew, with all the deafening rocket blasts and shuddering intensity required to escape the bounds of Earth. But then suddenly you are immersed in quiet, grandiose views of space, including scenes shot in IMAX showing the “magnificent desolation” of the moon. 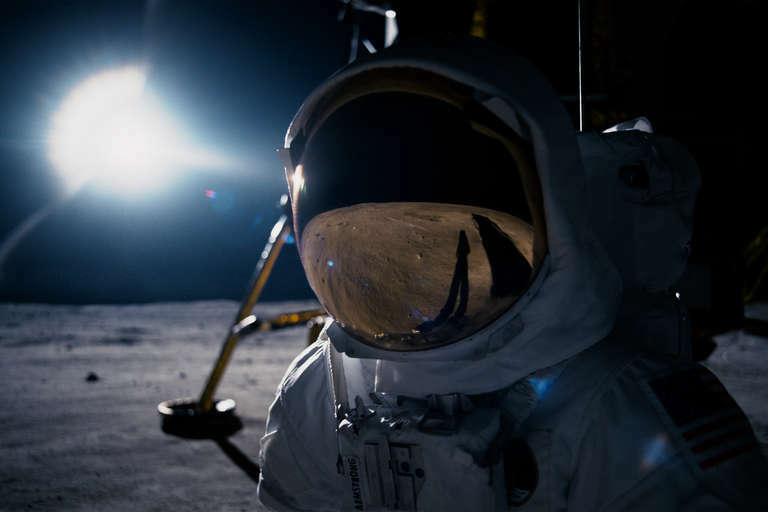 These changes of perspective underscore Armstrong’s testament early in the film of how space exploration changes a person’s outlook and provides an entirely new perspective. 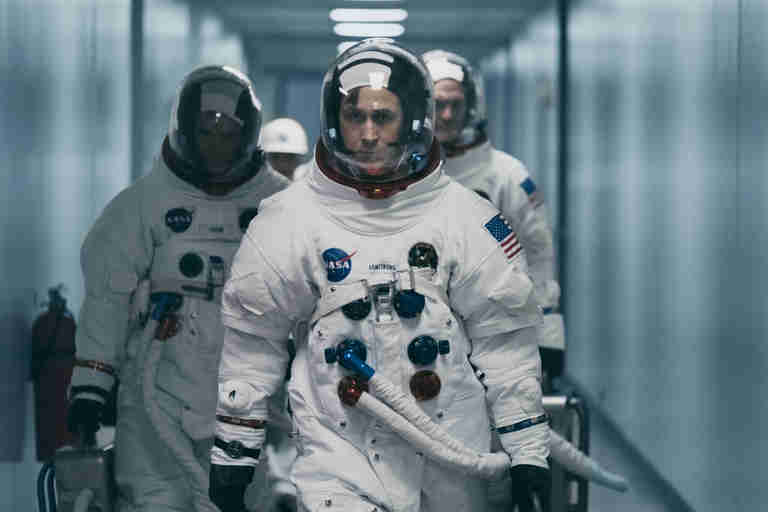 If you are looking for stirring patriotism or an Apollo 13 -style deep dive into NASA’s ingenuity, First Man is not that. Instead, we get a look into Armstrong’s life and his relentless pursuit of his goals, with multiple failures along the way and a tremendous person toll. RELATED: Will We Ever Be Able to Colonize the Moon? 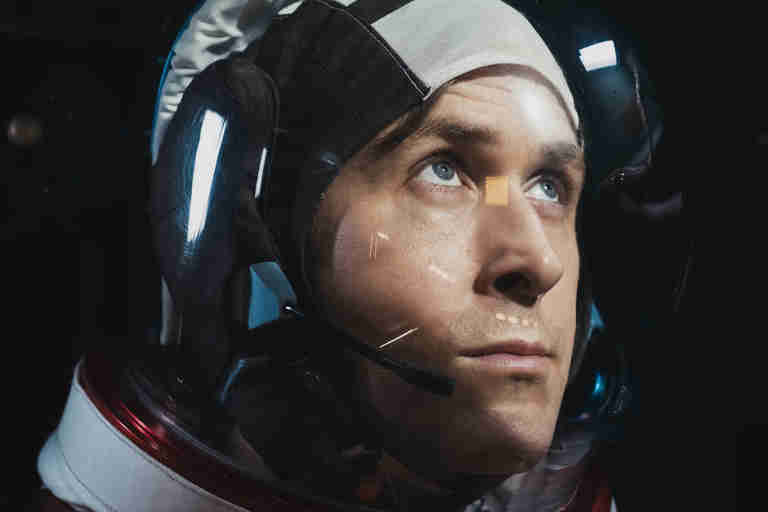 The film includes numerous close-up shots of the eyes of Gosling as Armstrong, as if trying to peer into the soul of this man of few words. First Man reveals insights of Armstrong’s unique personality and family life. It puts viewers at the family’s kitchen table and other touching personal moments in fly-on-the-wall verité style. But the film never quite delivers a profound look into Armstrong’s psyche, except to portray how he was haunted throughout his life by the death of his 2-year-old daughter in 1962. 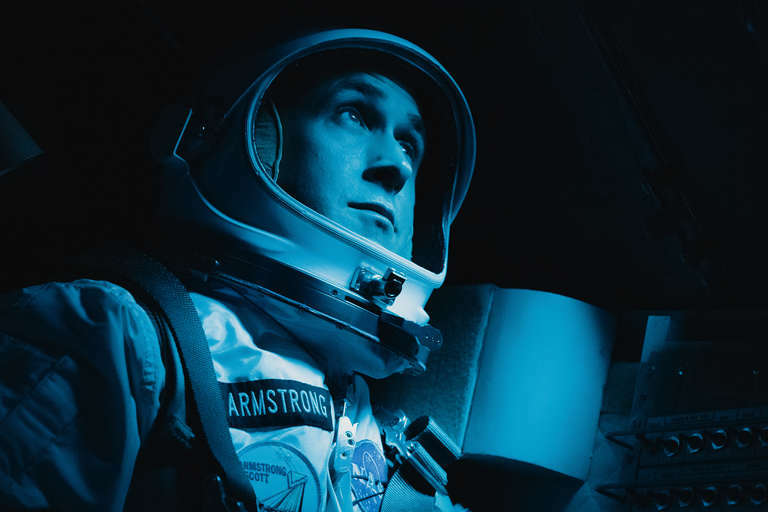 Based on James R. Hansen’s excellent official 2005 biography of Armstrong, First Man: The Life of Neil A. Armstrong, the film was made with the approval and input of Hansen as well as Armstrong’s sons. Hansen thinks that the movie completely captures the person he got to know through 55 hours of personal interviews. Some early reviews of the film indicated that the screenplay and Gosling “underplayed” Neil into a silent brooder — but, Hansen said, that was Armstrong. As quick as Armstrong could be in making split-second decisions in an airplane or spacecraft, he was really almost unbelievably deliberate in almost every aspect of his life. Hansen noted that there are some longer pieces of dialogue that came directly verbatim from things Armstrong had said, or from Hansen’s recordings from his interviews. The attention to detail and accuracy in the film is impeccable. Space buffs will recognize precise recreations of Mission Control, the suit-up room at Cape Canaveral, and various launch vehicles, as well as scenes from the lunar landing that are perfectly depicted. Actual recordings of the transmissions from Mission Control were used in the movie, including CapCom and fellow astronaut Charlie Duke’s famous mispronunciation, “We copy you down Twankquility,” in his genuine excitement after Armstrong and Aldrin finally landed at Tranquility Base. Hughes said some of his input to the filmmakers was subtle, but helped for greater accuracy. 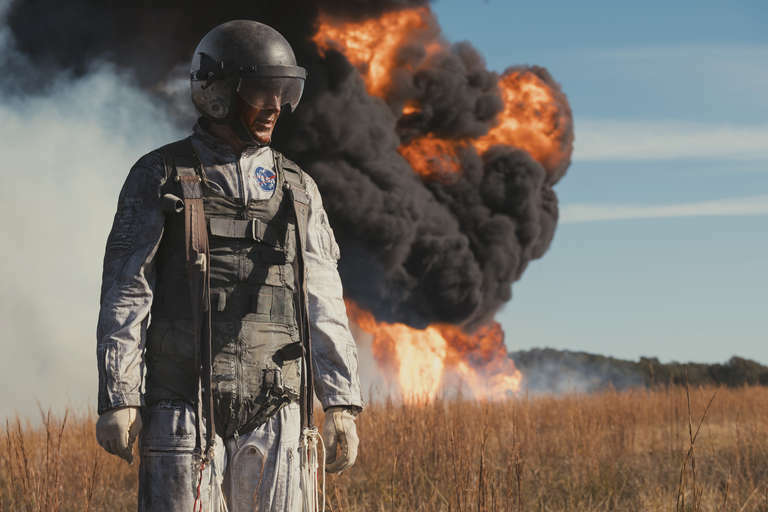 Hughes has worked as a consultant on other films, but said that First Man is the best he’s seen as far as technical accuracy. The film’s music is subtle but soaring at just the right times, but an evocative piece of music that the real Neil Armstrong listened to provides a movie thread. “Lunar Rhapsody,” a 1950’s sci-fi-style song that’s led by a theremin, is the background for an intimate exchange between Neil and Janet and later features prominently during a fun scene on the voyage to the moon. The scenes from the lunar surface were filmed at the Vulcan Rock Quarry outside of Atlanta, Georgia, that provided a perfect grey landscape. The owners of the quarry allowed the film crew to sculpt the quarry with craters and other features to recreate Tranquility Base. They filmed at night and used a bank of 200,000-watt SoftSun bulbs to get the correct lighting from the unfiltered sun. The scenes of the first steps on the moon are given a quiet reverence and solemnity that are breathtaking and memorable. A particularly moving scene occurs near the end of the film, when Armstrong makes an unscheduled excursion to a small crater near the landing site, called Little West Crater. What happens there will take your breath away. Hansen said that this scene happened in real life as Mission Control was already telling Armstrong to finish up the moonwalk and get back into the Lunar Module. Telemetry from Armstrong’s biomedical sensors showed that his heart rate went up to over 160 beats per minute when he was at that crater. So was Armstrong really unflappable and cool under pressure?